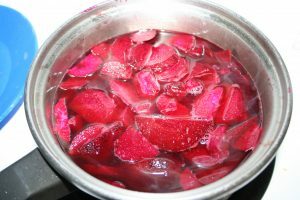 Pickled beets are a more unusual pickled vegetable. I’ve always found them too sour, and just taste like vinegar, until I found a great recipe for spiced pickled peets, which are pickled and slightly sweet at the same time. These are a delicious addition to your pantry, and are awesome with a charcuterie platter, or as a snack. So, yeah, this is messy af. You can lightly spray your hands with non-stick spray to keep most of the beet juice off your hands. You can save the beet greens and use them in a salad, if you want. They’re quite tasty! Slice into smallish chunks. Mix all the ingredients except the beets into a medium saucepan. Bring the ingredients to a boil until all the sugar is dissolved. Add the beets, and simmer on low until the beets have softened – about 15 minutes. At the same time, have 2 x 250 ml jars and lids boiling in water in a deep pot. 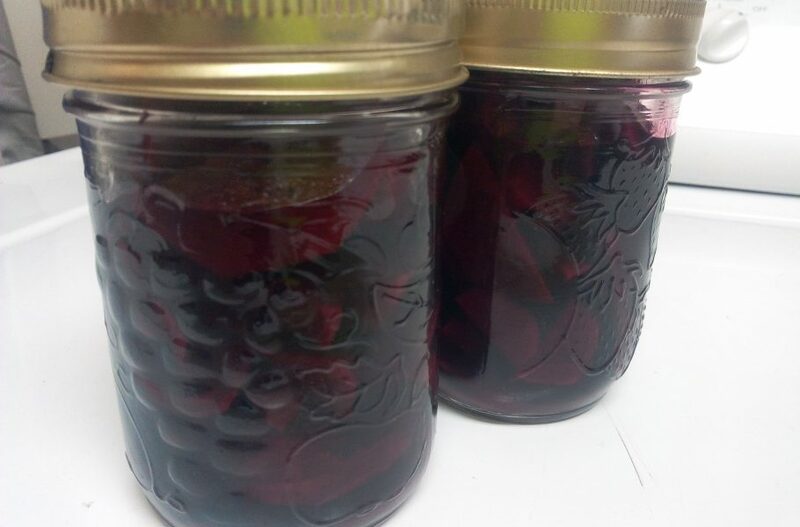 After the beets have softened, remove the jars from the water, and gently spoon the beets and liquid into the jars. 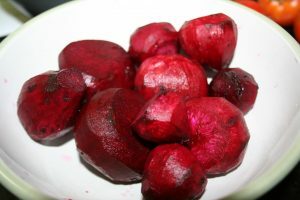 Try to fill the jars with the beets first, then pour the liquid over top. Seal with the lids, and wait for the jars to cool and the lids to pop in.